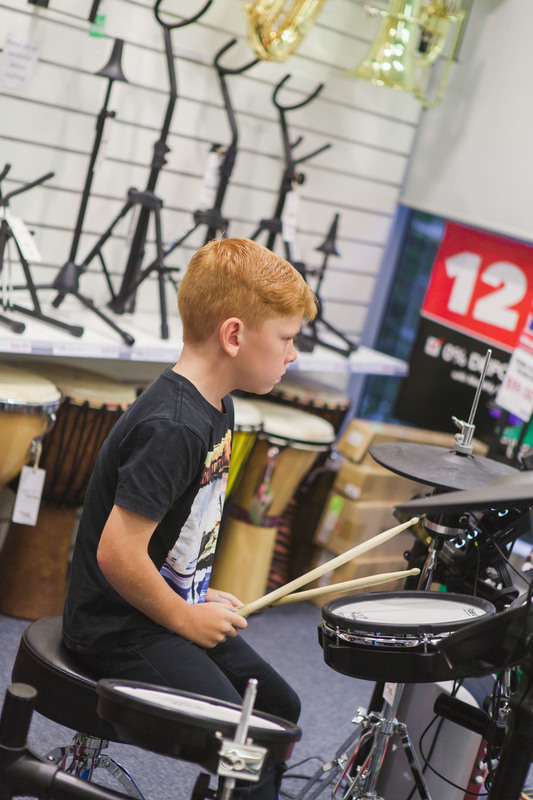 Great for co-ordination , and a fun way to let off some steam…just beat it all out there on the drum kit at Music Matters lessons. If you have room for a regular acoustic drum kit and can stand the wonderful “Boom!” of the bass drum in the house, garage or play room by all means purchase the best quality starter kit you can afford. There’s nothing like the “real feel” of a pair of sticks bouncing off a traditional drum kit head. You will be looking for a five piece full sized kit. You will need sticks and a music stand…to read the drum music! Mitchell’s intense gaze and focus at our recent Musical Celebration at The School Locker were only matched by his superb performance. If you prefer an electronic kit you will find is a good variety at The School Locker. Electronic kits have high quality digital sounds with hundreds of on board sounds, effects and audio loops and song patterns to choose from. You can pop on a pair of head phones and no-one knows you are practicing. The kit can be plugged into an amplifier and the volume adjusted to your liking. A metronome is often inbuilt as well. Children who have been through the Early Learning Music program will easily transition to drum/percussion lessons. Lessons include playing along with various CD tracks, playing duets, playing along with other instruments where possible. A range of method books are used at Music Matters including FastTrack, Alfred and the Progressive Series. Students are also welcome to bring their own books to lesson. Theory lessons are an integral part of drum/percussion tuition.